Roll them apples! In this fast-action dice game, race against your opponents to count the exact number of apples scattered in play. Watch out for birds, worms and apple pies that take away from the total. Count as quickly as you can and be the first to shout out the answer, but don't make a mistake or else you lose half your apples! 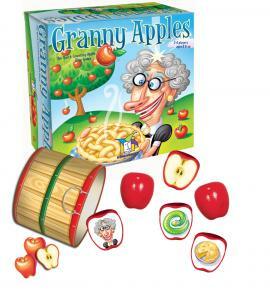 The player with the most apples when Granny's basket is full wins. Like an apple picked from the orchard, Granny Apples is a refreshing treat that is also good for you! Packed inside of this juicy little game are ingredients for learning the difference between halves vs. wholes while honing quick counting and visual identification skills. At the same time, it reinforces the importance of being accurate when doing mental math. And to top it off, since each player takes turns being the judge, the game helps to strengthen listening and attention skills. Smart on the outside â€¦ Fun to the core!